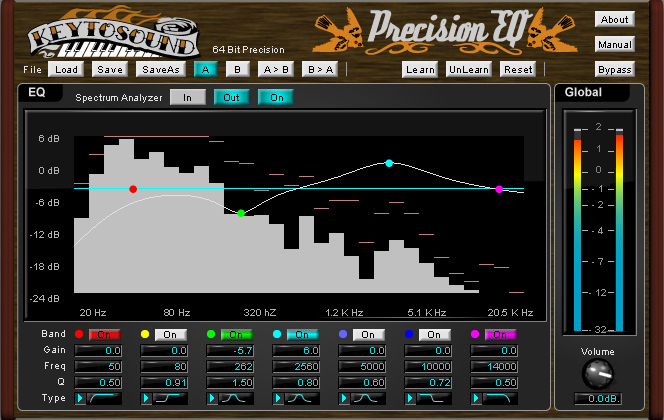 Precision EQ by KeyToSound (Koblo) is a Virtual Effect Audio Plugin. It functions as a VST Plugin, an Audio Units Plugin and an RTAS Plugin. The Precision EQ offers precise equalization. Featuring an FFT representation of either the input or output signal, you can see your equalization results, even if your ears deceive you. 7 bands with Gain, Frequency, and "Q" settings. 7 different filter types per band. Graphical drag and drop curve setting. Like neilpullen, I must say at the outset that the Precision EQ experience is very similar to the Vintage EQ experience: if you like Vintage EQ, you'll like Precision EQ; the workflow is identical, and they look and feel quite similar. Like Vintage EQ, Precision EQ offers 7 bands, with 7 filter-types, each switchable with Gain, frequency and Q-width available. 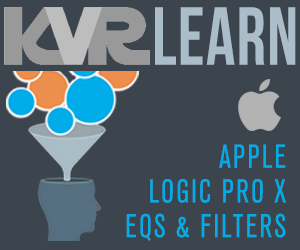 The EQ graph is draggable with a spectrum analyzer, so this EQ pleases those who like to use their ears, enter digits, drag nodes or use their eyes to zero in on problem frequencies. Again, KeyToSound seem to be shooting for an all-pleasing EQ here. The sound is very clean and transparent. I found I could bring out things like the tines on electric piano passages without disturbing the track or rendering it coarse and edgey. Likewise with a mix, and there is plenty of flexibility to do things like the cut & boost trick, while maintaining a clean signal. Again, no presets, but there is a preset system, and knowing KeyToSound, I'll bet some preset-sharing will turn up online at some point; the possibility is there, and internal file-systems are always a bonus with plug-ins, giving you that second layer of preset-security.